Who can resist back-to-back-to-back-to-back episodes of The Aquabats! Super Show! on the big screen? Frida Cinema is hosting a screening event on Saturday, June 27, with the Aquabats presenting all 13 episodes of The Aquabats! Super Show! playing from 10 a.m. to 4 p.m.
And sure, you can already binge watch the live-action kid's show (that's fun for grownups too) on Amazon Prime or Hulu, but watching it with M.C. Bat Commander, EagleBones FalconHawk, Jimmy the Robot, Crash McLarson, and Ricky Fitness sitting in the audience with you? With games and raffle prizes and live music from the goofy superheroes and their villains? At a small theater in downtown Santa Ana? Whoa. The Aquabats! Super Show! developed a cult audience when it aired on the Hub from 2012-2014, but the now-defunct network didn't opt to renew after the second season. “Jason (DeVilliers, who writes and directs the show with Jacobs) and I are still trying to get the show back on the air on another network, and we thought this would be a good way of connecting with the fans with the show,” Jacobs added. Fans will also get a chance to ask the Aquabats, crew members and special guests questions every two episodes. There will be photo booths, a meet-and-greet, and raffles at the event as well. 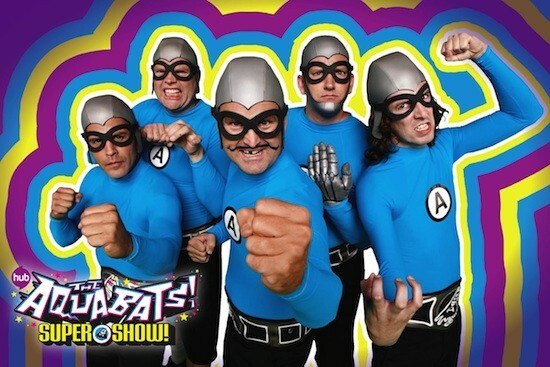 The Aquabats, 10 a.m. to 4 p.m., Saturday, June 27, The Frida Cinema, 305 E. 4th Street, Santa Ana, $25, all ages, thefridacinema.org. Follow us on Twitter at @OCWeeklyMusic and like us on Facebook at Heard Mentality.